All because the lady loves…. | More blue fabric? All because the lady loves…. I’ll be upfront. I’m not about to hand over a box of Milk Tray to every reader. 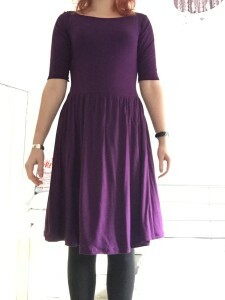 However, don’t you agree that my new dress is very Cadbury purple? Particularly as, for reasons beyond my ken, the camera appears to have over exposed in the background. How quickly it came together! I sat down at 3pm on Saturday and by 5:30pm I had a dress that was ready to wear out to dinner with friends (if we ignore the fact that I was lazy and didn’t hem the skirt until the Sunday….). Yup, I’ve already got the fabric to make it up for my dress for New Year’s Eve. I think that next time I’ll add the collar back in as I’ve realised I really like the collar, although I might use one of the add-on hacks you get when buying the pattern (let’s not kid ourselves, it’s going to be the Peter Pan collar because I’m a sucker for a PPC). So yes, all in all a delightful quick project, which was especially welcome as it feels like a long time since I’ve actually made anything! Now I just need to tackle a slightly longer-than-I-have-time-for list of things to complete before Christmas…. Wish me luck! Pingback: Me Made May 2017 - week two roundup - More blue fabric?